In the multi-agent scenario, interaction among agents is an issue that must be faced in an appropriate way. 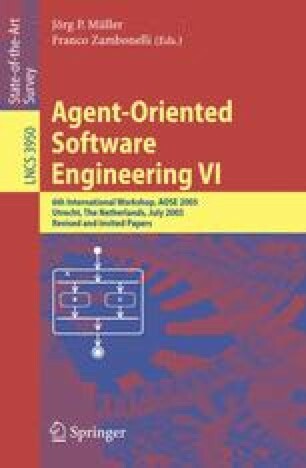 Modeling interactions by roles can simplify the development of the interactions in agent-based applications. The BRAIN framework proposes an interaction model based on roles, an XML notation to define roles, and interaction infrastructures based on the role model and notation. In this paper we explain how the BRAIN framework can be exploited in the different phases of the development of applications where agents play roles. The general advantage is that the development phases rely on the same information, adapted to different needs, granting coherence and continuity during the development.